Typically, I don’t plan where I’m going to do my workouts. I just keep a kettlebell in our truck and hope for the best. 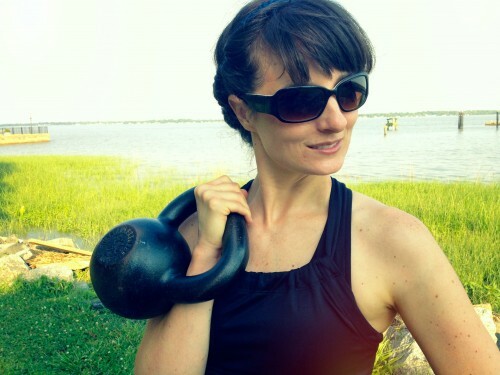 Sometimes this works out great and other times….I well….end up lugging kettlebells through a muddy Longhorn pasture. It’s all part of being insane the adventure. 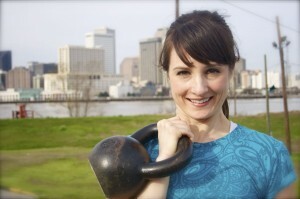 As it turns out there was a lovely spot to workout on the levee at Algiers Point in New Orleans. We left a little early on our way to the WWII museum and I did my workout in front of the skyline of one of the most fun cities in America. Then I spent the rest of my dad walking around New Orleans in dirty workout clothes. Awesome. At least it’s better than wearing a dobok around Las Vegas. Have you ever been to New Orleans? This was my first time and I love, LOVED, it. So did my boys. We actually ended up staying an extra day. You can read about all that we did here. I set my gymboss for 9 rounds of 45 seconds of work to 15 seconds of rest. Repeated 1-9 twice for a total os 18 mintues excluding warm up and stretching. I typically foam roll but not after this workout. I had beignets to go eat. Kidding. Sort of. 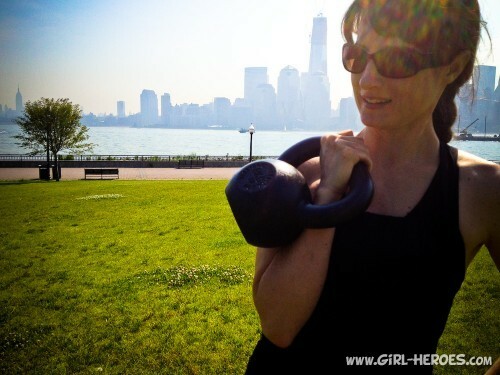 Here are some possible suggestions for a kettlebell beginner. – Do 30/30 intervals instead. – Omit the clean before the press and just hand off the bell between presses. – Swap out swings for snatches. – Goblet squats instead of potato squats. Alrighty, we are still in Florida but are headed to Savannah, Georgia and Charleston, South Carolina. Anyone have any suggestions on what to do??? Or live there and want to hang out? If you enjoyed this post you can follow one of three ways! 1. Subscribe to the RSS Feed 2. “like” Girl Heroes on Facebook, or 3. Sign up to have posts emailed to your inbox. Simple dimple! 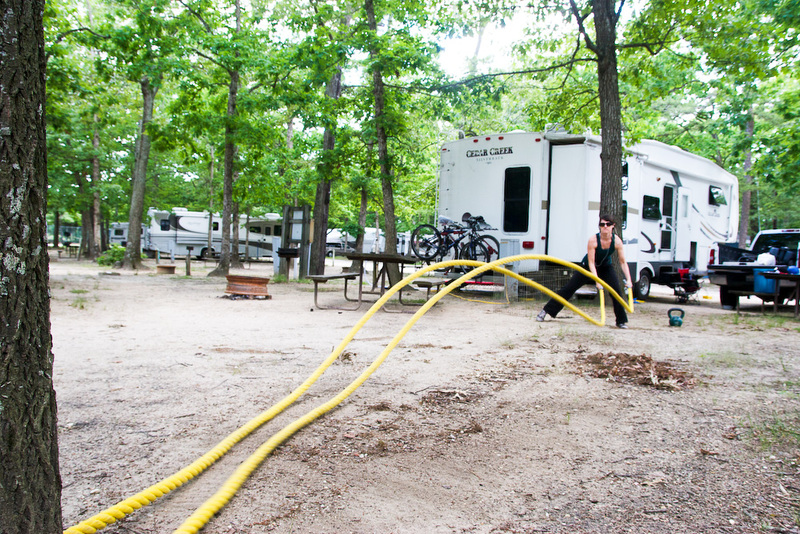 Check out our family’s adventures being inspired to follow you dreams at New School Nomads as we take a year long RV road trip through the United States! That’s great to know and exactly the sort of the thing I enjoy doing! Thank you so much!!! Great spot for a workout! The kid watched the video with me and kept on saying, “Wow. She is so strong. That’s hard.” You are his girl hero, too! You will LOVE Savannah and Charleston! Such history and charm – southern hospitality better be on display too! 😉 The trees alone are worth it from the pics I’ve seen. I’ve never been but they are on my “bucket” list! I think it was Savannah where my grandmother went and they ate on a pirate ship – so see about that as I’m sure the boys would love it! Oh and the other thing she mentioned was a gravesite of a little girl named Gracie – it gets lots of visitors. The man who made her statue also did many in the Bonaventure cemetery (supposedly haunted, yet beautiful) but he is actually buried in an unmarked grave! How sad and ironic. Anyway I just remembered that and wanted to tell ya! We LOVED Savannah!!! Going to Charleston early next week or this weekend! nice Workout. Maybe i make a workout for my hometown weimar too. 6 Letters = 6 exercises. this is entirely off topic but I haad to tell someone!